NCASS – the award winning student society – has raised £1,500 for The People’s Kitchen, Newcastle upon Tyne at its annual dinner. 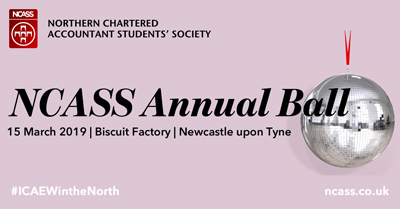 NCASS, the Northern Chartered Accountant Students’ Society held its annual dinner on Friday 15 March 2019 at the Biscuit Factory, Newcastle upon Tyne. The dinner was kindly sponsored by Nigel Wright Recruitment and NCASS would like to thank them for their continued support. The photograph above shows Rich Tiffany (NCASS Chair), Therese McCollam (NCASS Vice Chair) and other members of the NCASS committee celebrating their recent awards success with Maureen Armstrong from The People’s Kitchen. The dinner was another successful NCASS event attracting over 290 ACA trainees and newly qualified ICAEW members who enjoyed an evening of networking, pre-dinner drinks viewing the art work followed by a three course dinner and after dinner entertainment. 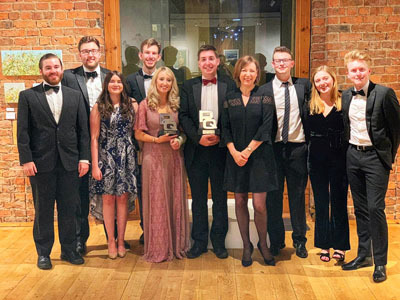 The dinner also provided the opportunity for NCASS to celebrate its recent success of winning the PQ Magazine National Student Body of the Year 2019 award. 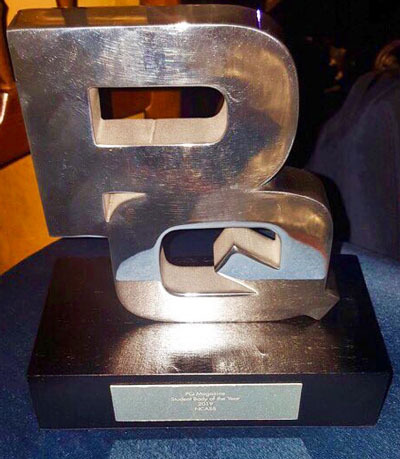 The PQ Magazine Awards were announced at a dinner held at the Cafe de Paris in London earlier in the month. The photograph shows members of the NCASS committee receiving the PQ Award from PQ Magazine Editor Graham Hambly. NCASS was delighted to have won the award for the second time in three years. NCASS also won National Student Body of the Year 2017. In 2018 NCASS were runners up to BCASS who won the award. 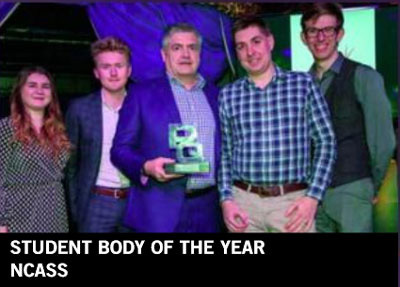 This years National Accountancy Body of the Year 2019 was AAT; in 2018 this was won by ACCA. In 2017 this was won by ICAEW. During the NCASS dinner at the Biscuit Factory on 15 March 2019 raffle tickets were sold with prizes kindly donated by a number of organisations. NCASS were pleased to be able to confirm at the end of the dinner that the raffle, with the support of Northern Society of Chartered Accountants raised £1,500 for The People’s Kitchen. Many thanks to everyone for your support in raising these funds. After the speeches attendees enjoyed music and a DJ who helped them dance the night away into the early hours. There was also an opportunity to look at both the PQ Award trophies won by NCASS in 2019 and in 2017 (the 2019 trophy is pictured below). NCASS is supporting The People’s Kitchen which provides a safety-net and a vital lifeline of friendship, food and clothing for the most disadvantaged in our society, the homeless and the vulnerable. NCASS (Northern Chartered Accountant Students’ Society) is the official body that represents ACA students under ICAEW training contracts in the Northern Society area in the North East of England and Cumbria. We have been supporting student chartered accountants across northern England since 1896 and we are part of the Northern Society of Chartered Accountants. Newly-qualified members join Northern Society when they have both completed all of their ICAEW exams and completed their period of practical work expereince when they are entitled to call themselves ICAEW Chartered Accountants. NCASS is run by ACA student volunteers for ACA students and, space permitting, new committee members are always welcome. Follow us on Twitter @followNCASS and join us on Facebook.